Tom East, aged 27, of no fixed abode, and Gary Woodwards, aged 25, of Middleton Road, Banbury, were both charged yesterday, July 26, with two counts of Section 18 - wounding with intent. Woodwards was also charged with threatening a person with an offensive weapon in a public place. 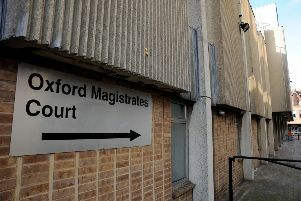 Both were remanded in custody to appear at Oxford Magistrates Court today, July 27. Samantha Halliday, aged 26, of Horton Drive, Banbury, was also charged yesterday with two counts of Section 18 - wounding with intent. She was bailed to appear at Banbury Magistrates Court on August 30. The charges are in connection with an incident at around 7.20pm on Wednesday, July 25, in Ruscote Avenue, Banbury, during which two men aged 64 and 36, sustained stab wounds during an altercation. Both victims have since been discharged from hospital.